Step back in time courtesy of DELOS and discover America's frontier in the most fantastic theme park ever!... Westworld! Westworld beckons you to live out your wild west fantasies...and boy do we mean wild! 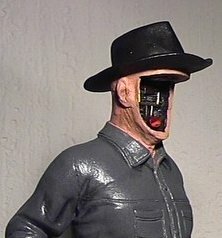 Not all the locals of Westworld are entirely friendly. Make enemies with some of the resident villains and they'll turn your vacation into a deadly game! Gunslingers are the quick on the draw, devious and extremely hostile...cross them at your peril! You'll need to be as fast as lightning to beat these fearsome characters! 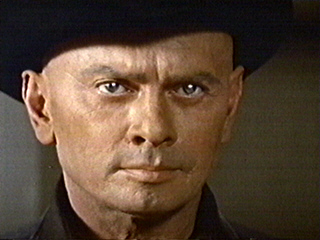 Despite all the furious action in Westworld do not fear as everyone is in complete safety. This is a theme park where absolutely nothing can go wrong. Yes, ladies and gentlemen, the DELOS resort is the most fantastic vacation destination on Earth. Why not see your travel agent today and make arrangements to take our hovercraft to Westworld...Boy, have we got a vacation...for you! 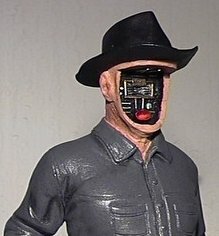 This WONDERFUL model of the fantastic Gunslinger Robot! 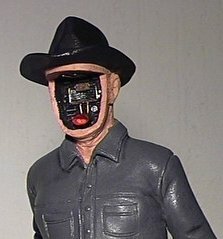 This superb model has been professionally sculpted to accurately represent the chilling presence of Westworld's most fearsome resident! Gaze into the internal Robotic structure of this mechanical menace and you will be transported into a World of total excitement and danger as his intimidating programmed personality beckons you to make... "Your move!" This excellent Gunslinger is made from solid resin and measures an impressive 8.5 inches in height. 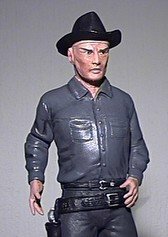 He stands on top of a solid resin model crate which looks as though it's come straight from Westworld making a total height of 11 inches, COOL! 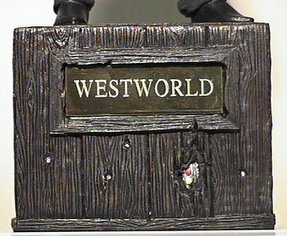 Also included on the base is the title "Westworld" which has an authentic brass-like appearance lending itself to the atmosphere of this model, WOW! He is professionally pre-built and painted and is ready to be displayed in your fine Robot collection. What a GREAT addition he will make! 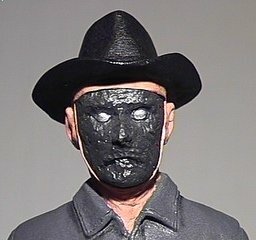 His eerie looking appearance can be taken a stage further by using the 3 excellent Robot face parts that accompany Gunslinger. You can choose to display him with his normal face as when we are first introduced to Gunslinger in the Saloon. Or, you can add a little more atmosphere to the model by using the slightly damaged face part with eerie Robotic eyes and facial scar as when we see him in Medieval World. 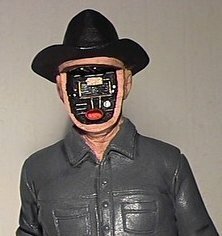 Or for that real eerie appearance he can be displayed with a burnt out face plate as when we see Gunslinger in the dungeons of Medieval World where the mind of this Robot will absolutely not stop until he has completed his mission, AWESOME! Remove the face plate completely and he can be displayed in full Robotic style displaying internal components which gives this model a truly stunning appearance! totally AMAZING! 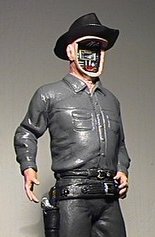 This completely wonderful Gunslinger model was constructed and painted by a team of professional model makers in England UK who have brought to life one of the most terrifying and interesting Robots from the big screen. He was made in 2004. 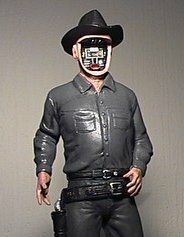 Fans of the superb movie Westworld and Robot collectors around the World, don't miss out on this opportunity to acquire your very own RARE Gunslinger Robot! He looks completely stunning and will make a superb addition to any fine collection! Put this model next to your Robby the Robot, Gort Robot, B-9 and YM-3 Robot for that extra special movie Robot addition!